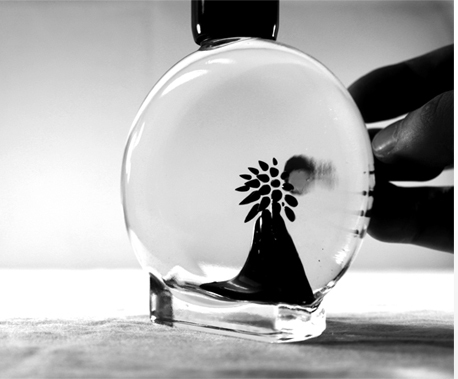 BUY INDIVIDUAL SELL CONCEPT ZERO WHAT IS FERROFLUID? 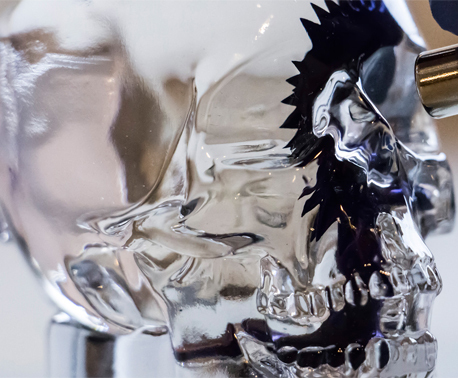 Conzept Zero is the original ferrofluid art and design studio, producing the world's most recognisable and sought after desktop ferrofluid displays. For fun, as a display or for the love of art there is nothing quite like Concept Zero and each display is supplied with its own powerful neodymium magnet. Below, you can buy all our displays individually, with next day delivery available. Alternatively, contact our customer service team for trade pricing and availability. 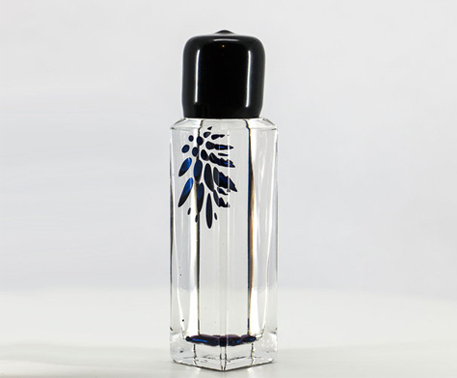 SPYKE 60ml£58.33 exc. VAT Spyke is a fully-sealed display unit with 2ml of ferrofluid suspended in a unique liquid which allows the ferrofluid to flow and spike when the supplied magnetic stylus is brought close to the display. 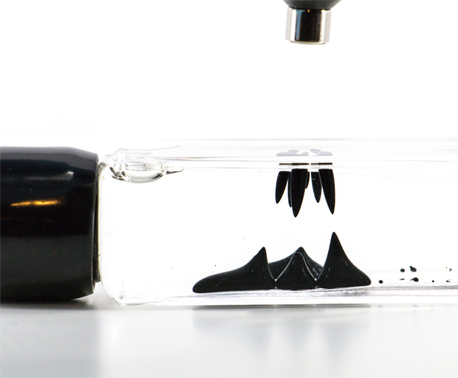 When not in use, the ferrofluid sits atop the three rare earth magnets hidden in the base. The vibrant back-drop to the Spyke creates a striking contrast with the pitch black ferrofluid seemingly adding extra definition to the effects you create. Concept Zero ferrofluid displays are the latest gadget and desktop executive gift taking the world by storm, exclusively distributed in Europe by first4magnets. If you are a brick and mortar retailer, or e-tailer and would like to add these unique ferrofluid displays to your range then contact our customer service team today. Trade pricing is available on all our ferrofluid display products with next day delivery available too. We'll also help you promote the products by supplying product photography and videos for you to use. 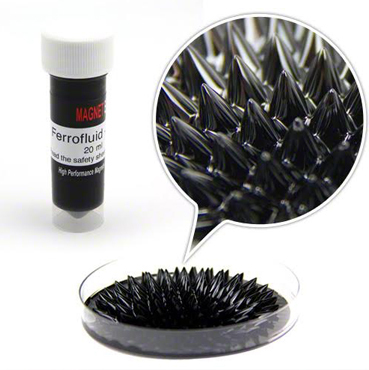 Ferrofluid is an amazing liquid which reacts to the influence of a magnetic field. When a magnet is nearby the previously runny liquid suddenly starts to solidify and grow spikes that follow the pattern of the magnetic field produced by the magnet. The stronger the magnetic field the more dense and defined the spikes become. Introduce two magnets and the fluid will create strings between them. If you have never seen this liquid before, you will be absolutely amazed by the fascinating effects you can create. Originally created by NASA for use in space shuttles, ferrofluid looks and behaves like something from another world and why it is commonly used by world-renowned film makers and music video producers for visual special effects. 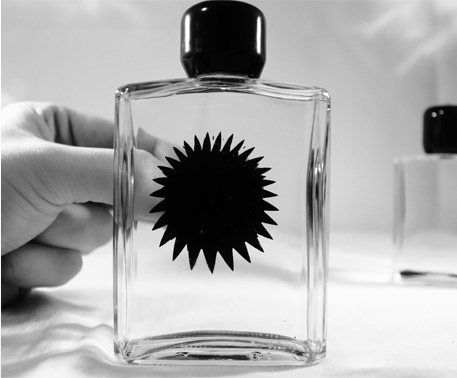 Ferrofluid can be purchased by the millilitre, in a minimum of 20ml tubes. Or, as part of a set with a pipette and Petri dish, ideal for experimenting with or creating your own displays.